Astronomers from the University of California, Irvine (UCI) and other universities have derived a highly precise measurement of the mass of a black hole at the center of a nearby giant elliptical galaxy. Working with high-resolution data from the Atacama Large Millimeter/submillimeter Array in Chile, the scientists were able to determine the speed of a disk of cold molecular gas and dust orbiting the supermassive black hole at the heart of galaxy NGC 1332. From there, they calculated the black hole’s mass to be 660 million times greater than that of the Sun. To calculate the mass of a black hole in a galaxy’s center, astronomers must be able to measure the speed of something orbiting around it, Barth said. Located at 5,000 meters altitude in the Atacama Desert of northern Chile, ALMA is a powerful array of 66 radio telescopes designed to conduct observations at millimeter and submillimeter wavelengths. Dense, cold clouds of interstellar gas and dust don’t emit visible light, but glow brightly at wavelengths that ALMA can observe. 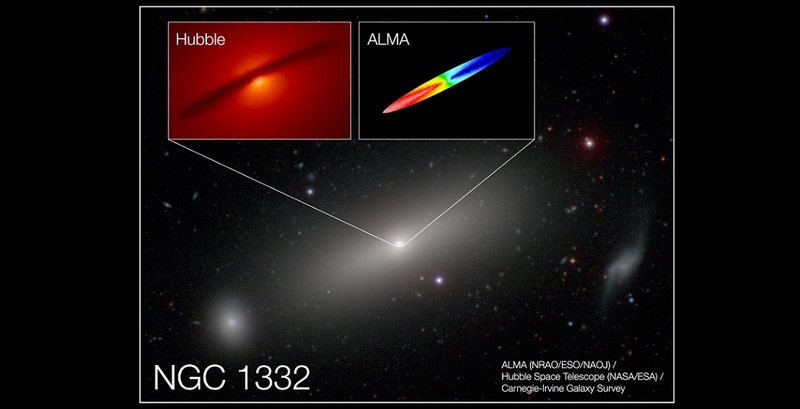 Barth and his group trained ALMA’s observational powers on NGC 1332, a giant elliptical galaxy in the southern sky 73 million light-years from Earth. Elliptical galaxies are known to contain massive central black holes. About one in 10 elliptical galaxies contain disks of cold molecular gas and dust that orbit their centers. In visible light, as seen by the Hubble Space Telescope, these disks appear as dark silhouettes against the bright background of starlight in a galaxy’s core. But ALMA can observe radio-wavelength light emitted by molecules in these structures. The emission is shifted to shorter or longer wavelengths by the Doppler Effect depending on whether the disk’s gas is rotating toward or away from observers, which enables astronomers to map the motion of the gas. In this case, Barth’s team focused on radio-wave emissions from carbon monoxide (CO) molecules, since the CO signal is bright and readily detected with ALMA. In September 2015, they studied NGC 1332 again with ALMA, this time using its high-resolution mode to produce a far more sharply focused map of the disk’s rotation. This new map resolves details as small as 16 light-years across. Crucially, this makes it possible to probe the disk’s rotation within the black hole’s 80 light-year sphere of influence region. The ALMA data show that near the disk’s center, the rotation speed of the gas reaches 500 kilometers per second. By mapping the disk’s rotation with the high-resolution data, Barth’s group determined that the black hole in NGC 1332 has a mass that is 660 million times greater than the Sun, with a measurement uncertainty of just 10 percent. This is among the most precise measurements for the mass of a galaxy’s central black hole. Past measurements of black hole masses from mapping the rotation of gas disks have mostly been based on hotter disks of ionized gas that glow at visible wavelengths and can be observed with the Hubble Space Telescope. However, ionized gas disks tend to exhibit more turbulent, chaotic motion, which lowers the precision of the mass measurement. A major advantage for ALMA is that dense disks of cold molecular gas, like the one in NGC 1332, appear to have a more orderly structure with less turbulent motion, which leads to a more definitive measurement. In addition to Barth and Boizelle, the research team included David Buote of UCI, Jeremy Darling, University of Colorado; Andrew Baker, Rutgers University; Luis Ho, Kavli Institute for Astronomy and Astrophysics, Peking University; and Jonelle Walsh, Texas A&M University.